You and your betrothed are walking hand in hand through the trees, the snow crunching under your feet and your fur Bolero keeping the cold at bay as the warm and cosy log cabin comes into view. What could be more romantic than the two of you, joined by your nearest and dearest, rejoicing the coming together of two families in a gorgeous snow topped remote hideaway in the woods for a celebration of a lifetime? If this sounds like the wedding of your dreams then this invitation from Norma & Dorothy could well be the one for you! Equally suited to a barn wedding, Christmas wedding or even an eclectic mix of the above, the Winter Wooden Snowflake with Bunting truly celebrates all that is great about winter weddings! 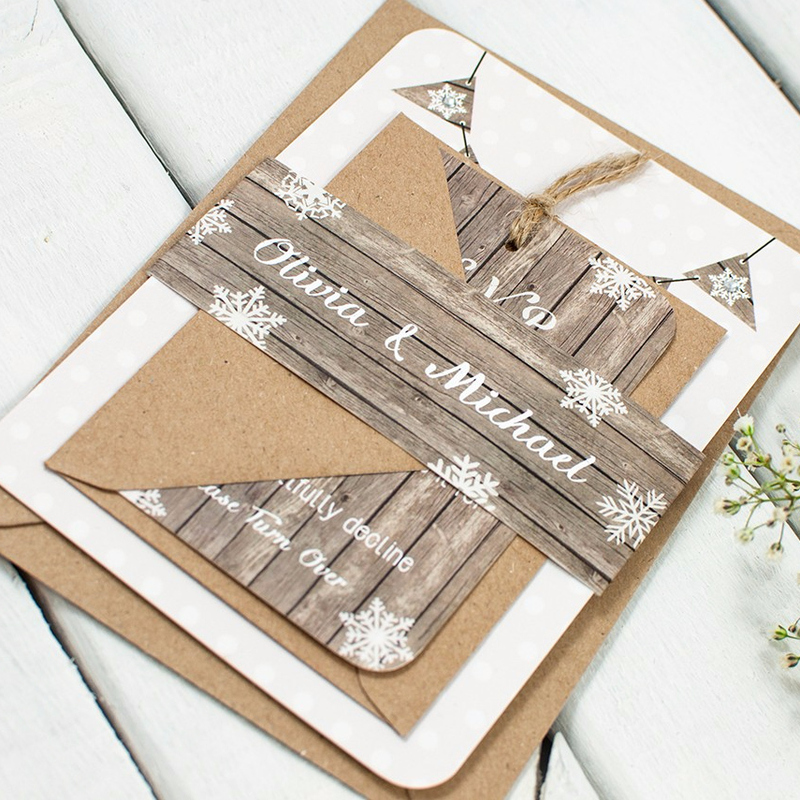 The beautifully rustic wooden effect that adorns much of the invitation creates a warm contrast to the twinkling snowflakes and ice-white wording. The mix of authentic wooden tones, hessian browns and crisp white make this invitation really stand out and incite joy and happiness to anyone lucky enough to receive it. Slide off the bellyband (included) to reveal the RSVP card, attached envelope and of course the all-important wedding day details. Perfected formed snowflakes are printed on the wood effect bunting at the top of the invitation to keep the winter theme well and truly alive, whilst the wording and colour scheme are all totally customisable for that bespoke touch. So if you’re hoping to wake up to a flurry of real snowflakes on your wedding day, or you’re creating a festive style wedding day, the Winter Wooden Snowflake with Bunting invitation is sure to spread the pre-wedding excitement throughout your guest list! Tags: Bunting, Christmas, Parchment, Rustic, Snowflake.